I got there towards the later part of the event, so not very many items were left for tasting. Therefore, I took the time to stop by the booths and chatted with the folks there. I found out about PEI Beef, and that Glowbal Restaurant Group is the exclusive restaurant buyer of PEI beef here in Vancouver (I was quite impressed by the meat quality when I ate at Black + Blue earlier this year). You can also get it retail at perhaps two meat shops locally. It certainly brought back some fond memories of my work in the agriculture industry a few years back when I saw Freshpoint’s tables. Through this event, I made two major discoveries that I want to share with you here. First of all, the venue; then, transportation to and from the event. 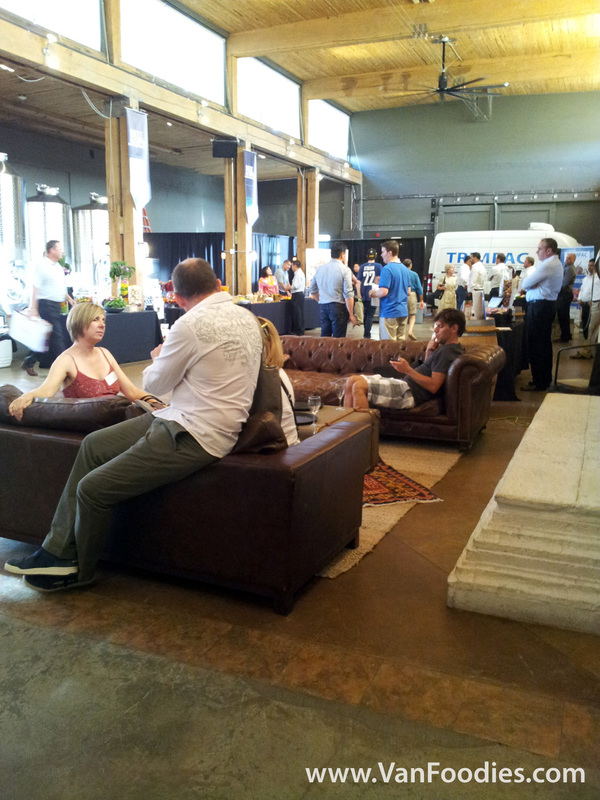 The event was held at Vancouver Urban Winery – it’s such a cool space! Located in Railtown, it was open just 2 months ago, and I’m glad that I have already found out about it. What is cool about them is that they serve wine on tap. Yes, on tap like beers! They are the supplier of Tap & Barrel so if you have been to the restaurant you would be familiar with the concept. But for those who don’t know, wines there are basically stored in stainless steel kegs that can keep them fresh for about 7 months! I talked to Dave the sommelier, and he told me that the trick is with the constant pressure from the nitrogen gas that eliminates oxidation. Vancouver Urban Winery is open for wine tasting Monday to Friday. Pricing is pretty reasonable too. $10 for 5 tastings, or on Thursdays and Fridays they do 5 food & wine pairings for $20. Would be a fun evening out with friends. I love the Dessert Hills Gewurtztraminer and their very own Roaring Twenties Malbec. Yes, they also have their own wine label, Roaring Twenties Wine Co., which you can buy by the bottles on location. Thanks to the event organizer, each attendee received a promo code to use the service of Uber Vancouver. Uber is an on-demand black car service and it’s quite convenient to use! Download the app on your iPhone or Android phones, then put in a request and your ride would arrive within minutes. I was amazed by how easy it is, especially it includes information of the driver (with picture) and tracking of the vehicle. I knew exactly when my ride would get to the door. Of course, the best part is that it’s a private ride in an unmarked black car. I felt like a celebrity when getting picked up to and from the event! Getting picked up by a spiffy ride! Thanks Uber! Cost to call a ride via Uber is about 30% more than calling a cab, but if you need a ride for a few friends to a party or something, this is a pretty good option considering this is like a limo ride.